South Dakota legislators have created a bill that would require women requesting abortions to view a sonogram of the fetus and listen to the heartbeat before continuing with the abortion process. Senate Bill 6 would change the current law which states, “[offer] the pregnant woman an opportunity to view a sonogram of her unborn child.” This would make the viewing of the sonogram mandatory, rather than a choice. Dakota Wilson, Students for Reproductive Rights member, said he doesn’t believe this bill is necessary. Medical professionals would be required to show the patient the fetus on the sonogram and then proceed to have the woman listen to the heartbeat if available at the time. Currently, in South Dakota, patients must abide by a 72-hour waiting period before undergoing the procedure after their initial appointment. However, students who are pro-life look at this bill as a way of protecting the mother and child. Karleen Murtha, Yotes for Life President, said this bill will help educate women who are considering abortion. Murtha said Yotes for Life is not doing anything to support this bill because they are not a political group. “Our focus is to provide resources and information to women so that they can be empowered to be pro-life,” Murtha said. 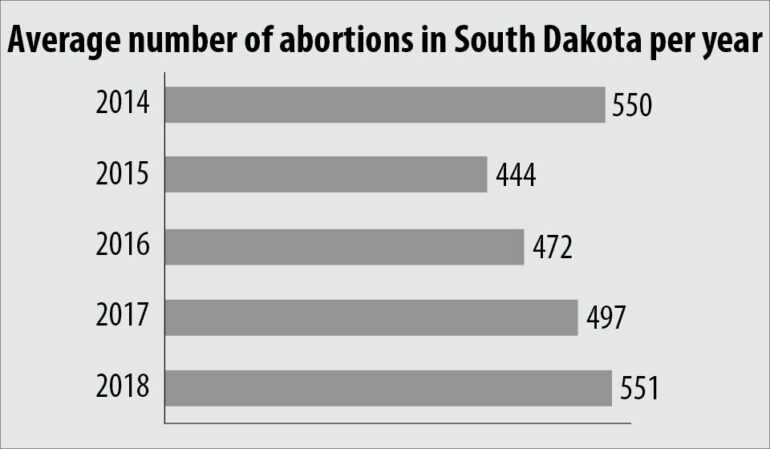 Newly-elected governor Kristi Noem is pro-life and said while campaigning that she will sign harsher abortion laws. The proposed bill could affect students who may be seeking an abortion.